It was a damp, miserable morning on the gallops in November 2016 when an unlucky fall was to alter the direction of my life. I had landed, rather uncomfortably, back first on to a tractor rotavator. As I lay on the wet sand waiting for an ambulance to arrive, the pain was severe, but I could feel my legs so I wasn’t unduly worried. It’s always the first thing to cross my mind when I find myself lying in the dirt, staring at the sky again. A visit to Leeds General confirmed a broken sternum and four broken bones in my back. 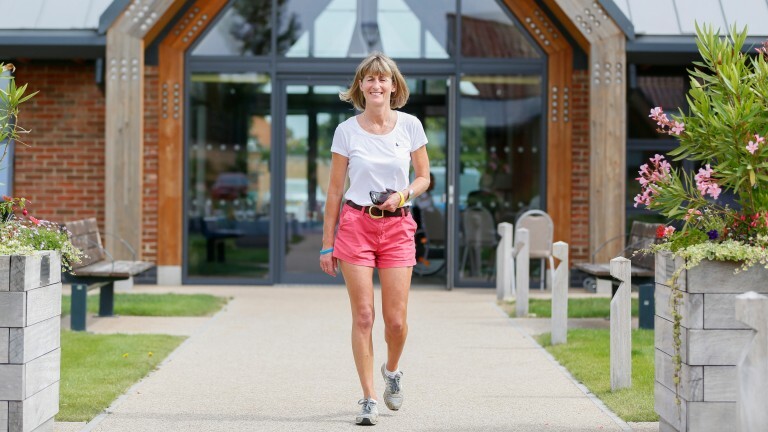 Basically, my pelvis had detached itself from my spine, which meant an operation to fit two ten-inch screws to hold my spine and pelvis in place. In addition, a metal hook had pierced my back, gouging out an egg-like lump of tendons, ligaments and tissue just millimetres from my spine. 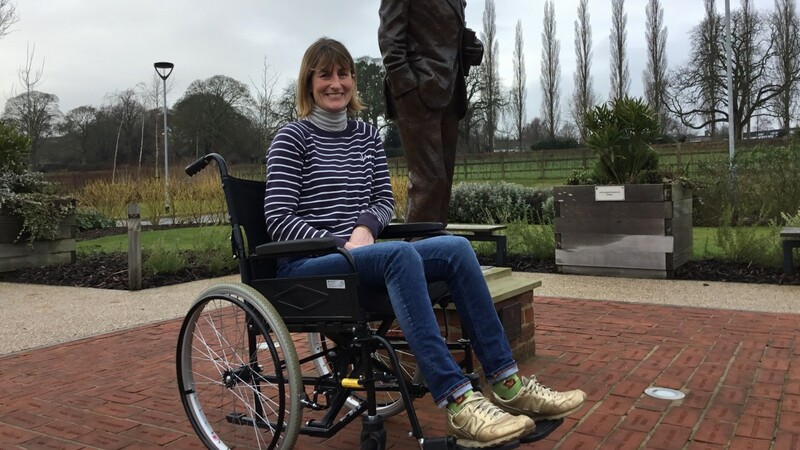 The outcome could have been quite different – a ten-week stint confined to a wheelchair seemed a small price to pay considering the alternative. I spent two weeks in hospital. The staff were fantastic and the service first class – I didn’t want to leave. When I finally did, I couldn’t go home. My old farm cottage on the yard was full of steep stairs, draughty passageways and narrow doorways, impossible for a wheelchair-bound trainer, so I moved into my parents’ house. They had converted a downstairs sitting room into a bedroom, but their beautiful home was to become my prison. A few people visited regularly over the following months offering help and assistance. A reliable friend took in my hunter realising it would ease my staff’s workload, another brought me books and cooked meals. Little things that meant so much. Some friends I most expected to be around and offer support at a time I needed it never appeared. Help doesn't always come from the direction we expect. One day a friend I hadn’t seen for years called to see me, it was a lovely surprise. Fat Jack, as we call him, is a character. He calls himself a wheeler-dealer in racehorses now, after a stint selling cars and driving various trainers to the races. He’s the sort who comes out of a tricky situation smelling of roses. We were sat chatting when the local vicar turned up to remind me God was there in my time of need. He wanted us to pray together. Jack looked startled. I had to laugh as he kneeled down next to the vicar, with his hands together, by my bed, an image I never thought I would see. Jack has more sins to confess than a pregnant nun and is as far removed from Jesus as one could find, but he shut his eyes and prayed with the vicar. It was a touching sight, until he turned to ask the reverend if God would mind obliging in letting us pray for his horse, running in the 4.30 at Wincanton, to come in. My staff were unbelievable. They kept the yard going through the dark winter months and never let me down. My father, a farmer and irreplaceable assistant, took horses to the gallops every day and took on my workload as well as his own. Without his input my business would have folded. He is 70 years old, although he doesn’t look it – a fact I find increasingly frustrating when strangers mistake me for his wife, as they often do (he is actually 25 years my senior). Everyone was trying to help, assisting each other with running my businesses, caring for my son, all my animals and the yard. How could I not be grateful? I was, of course, but things were becoming increasingly challenging. Unable to get out of the house in my wheelchair, hours of solitude were taking their toll, day upon lonely day. I couldn’t sleep and swiftly descended into a quagmire of depression. The pain was irrelevant. Like failure, it is there to make us stronger, as I have always told my 11-year-old son. I kept being reminded how lucky I was from people who visited, but I didn’t feel it. I wasn’t prepared for the mental torture I felt from such confinement. Having your independence totally removed is a strange experience. It was my partner Pete who carried me through the early days. He was a rock, the person I waited to see early in a morning when he called in to say hello on his way to work. The highlight of my day was him arriving back at night and wheeling me out of the house along the muddy lane to get some fresh air, the only time I felt almost normal. He took my horses to the gallops, rode out, picked my son up from football, cooked the meals – everything I had done before my accident, along with his own full-time job. I wrote him long, emotional letters telling him how grateful I was for his love and support, and I could never repay him. It wasn’t enough. We had a strong relationship, but nothing prepares people for a life-changing accident and how it might affect you. He couldn’t take it and left. He had met a girl who made him "feel happy again", he explained while packing six years of memories into his car. Normally I would have thrown myself into work to take my mind off things. It wasn’t possible, empty days stared ahead of me. Too much time can be destructive and I felt completely unable to reach out to anyone. My existence plunged into a lonely darkness. It was easy to pretend everything was okay. When people were around I was fine. Woody Allen said "The heart is a very resilient little muscle . . ." so I acted like everything was normal. I tried to be as upbeat and positive as possible, because that’s what others wanted to hear. They didn’t want to sit with a sobbing wreck of emotion unable to deal with what life has thrown at them. With company I could laugh, but alone it felt like I was suffocating. 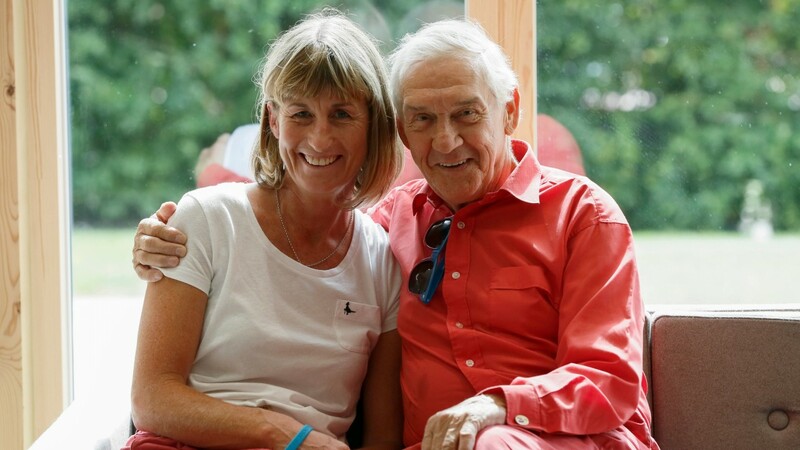 It was my friend and owner, Injured Jockeys Fund vice-president Jack Berry, who offered the guiding hand. He insisted I go to Jack Berry House, a sanctuary that would finally pull me from the hellhole. I wasn’t convinced it would make me feel much better, but I agreed and arrived just before Christmas, six weeks after my accident. Just entering the place, I could sense a change. There was a positivity, an understanding. The people who loved me at home had not known what to do or how to deal with my situation. They had tried but I am not the easiest person to deal with at the best of times. Here I didn’t need to explain, they had seen it all before and knew what I was experiencing. It was such a relief not to feel alone. From the start, the staff have been astounding in their detail and determination to get me back to full fitness. We took things day by day, slowly building up my strength and self-confidence. It has been one of the longest, most interesting, frequently frustrating, totally enlightening, soul searching, enjoyable journeys of my life. The mood there is so incredibly upbeat, the staff make everything positive and fun. Without them I couldn't have got through it with my sanity intact. My days were filled with physio, hydrotherapy work, gym fitness and training, along with Pilates and yoga, which is tougher than I ever expected. The results have been amazing. I am not yet allowed to ride a horse or run a marathon, but I feel healthy and physically stronger than I have since I was racing-fit. There is still pain, maybe there always will be, but painkillers help me to live a near-normal life and my rehabilitation is ongoing. I'm awaiting a final CT scan to see if I will ever be able ride again. Fortunately, my staff can deal with the tricky horses I used to ride – I manage things from the ground now. Everything has been winning or at least running well, so there is excitement building for next season. 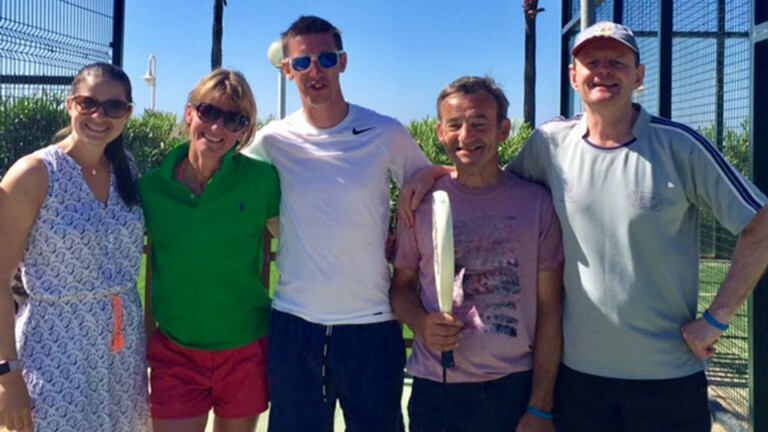 A few months ago, I was invited to attend the IJF beneficiaries' holiday to Spain in June. I hadn’t thought my injuries serious enough to warrant such an invite, but there was a place and they thought this trip would benefit me, so I accepted. I'd hoped it might act as distraction to the dark moments that still persisted at the oddest moments of the day and night. Little did I realise the impact this holiday was to have. If falling on to a rotavator had altered the direction of my life, this holiday was to throw me on to a completely new path. I was one among 80 beneficiaries who arrived at a peaceful fishing village, where tiny whitewashed cottages sat on the edge of an endless golden beach. It was a blissful place. The hotel catered for disabilities of every kind. There are sports courts, volleyball pitches, gyms and swimming pools. Everything was laid out so even the most immobile in our group could get on the beach or in the pool if they wanted. The party was a mix of beneficiaries (ex-jockeys), long-suffering carers, trustees keen to meet those they dedicate their spare time to helping, chairman Brough Scott, Jack Berry and his wife Jo, head of rehab Ed Stroud, a fellow sports rehabber Cat Pearson and the IJF almoners, who have such a tough task in organising the whole trip. The ex-jockeys who attend have all manner of injuries they deal with on a daily basis, either of the mind or the body. I met girls who I’d ridden against years ago left paralysed following a fall. Some lads had broken their necks in car crashes, others had suffered head injuries or concussion. Many, like me, were recovering from back injuries. Injury is indiscriminate. Young and old, rich and poor, all from diverse backgrounds, with a common bond. Thrown together. We were like one big family. The staff and almoners gave those who wanted it daily physio, training, yoga or swimming assistance. Nothing was too much trouble. 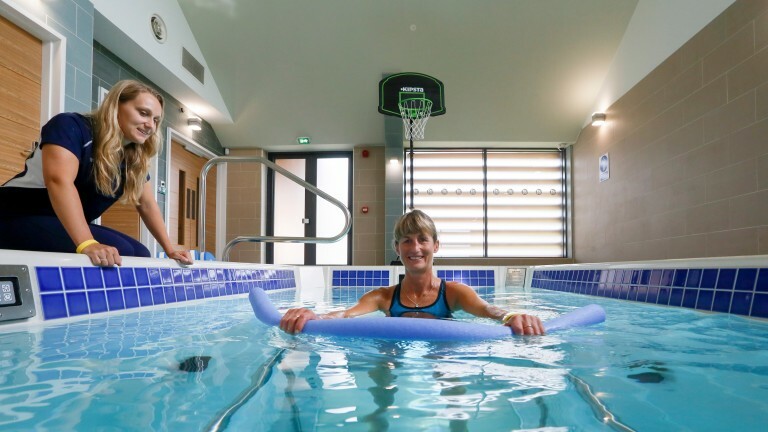 A few days into the trip one beneficiary, ex-trainer Rhona Elliott, who is now confined to a wheelchair owing to her MS, plucked up the courage to go for a swim in the pool. She admitted afterwards how much it meant to do something that had once been so simple. "For those ten minutes I was free, I felt normal again," Rhona explained. This trip, I soon realised, was more than just an annual holiday to these people. Time is so precious, we hurry around and rarely have enough of it. Here there was no rush. People talked, lots. They told me of their accidents and how they cope, the carers compared situations and found strength in each other’s company. Never once did I hear a moan of self-pity during the week. Talking is a valuable healing process too few of us have the luxury of throughout our busy lives. Even detached, lonely souls who arrived locked inside their shell slowly opened up as the days went by. For me, it was an escape. A place to evaluate life and reset my goals. I swam for hours in the sea, the hot sun melted away the hurt in my creaking body and healed my broken mind. I walked along miles of golden sand as the fishermen hauled in their catch at dawn. I played tennis with amazing people, who are no less competitive now as when they were winning races –they just appreciate things a little more. I talked endlessly to retired jockeys who are still searching for a new role, who are a little lost in finding the same level of fulfilment racing once gave them, and I could empathise. We laughed, we cried, we drank and we did Zumba. One of the trustees, Michael Caulfield, a sports psychologist who ran the PJA until 2003, was determined to make everyone’s trip memorable when he volunteered to take a Zumba class in the pool. It soon became clear he knew absolutely nothing about Zumba – but he did know how to entertain. I laughed until I cried many times over. I can’t remember the last time that happened. For so many of the beneficiaries, being on this holiday is their only chance to feel normal, free, understood and accepted. I felt honoured to be a part of it, to sit alongside such inspiring, compassionate people determined to make life count. I had lunch by the sea with Brough, who was stimulating company. He has worked incredibly hard in his chairman's role since 2007 and has been a trustee since 1978. I played tennis with George Baker, whose horse fell racing in Switzerland 18 months ago, leaving him with a serious head injury. Sarah Gaisford, another jockey I met on the track, broke her neck in a fall at Exeter in 2007, paralysing her from the chest down. At the time, she was a 39-year-old single mum with a 12-year-old daughter to bring up. Quite how she managed to keep her life together I will never know, but she did and both Sarah and her daughter were there enjoying the sun and the company. She is a beautiful, classy lady. Her positivity and sense of fun radiates. She took up tennis a few years ago and is now ranked fifth in Britain, travelling all over the world to play in tournaments. Many beneficiaries struggle to be so positive. They just need time spent on them to make their lives better. The almoners visit regularly, offering help and company, support and assistance when they need it. They are the lifeline to a bearable existence for many. It takes my breath away to be part of such an industry. 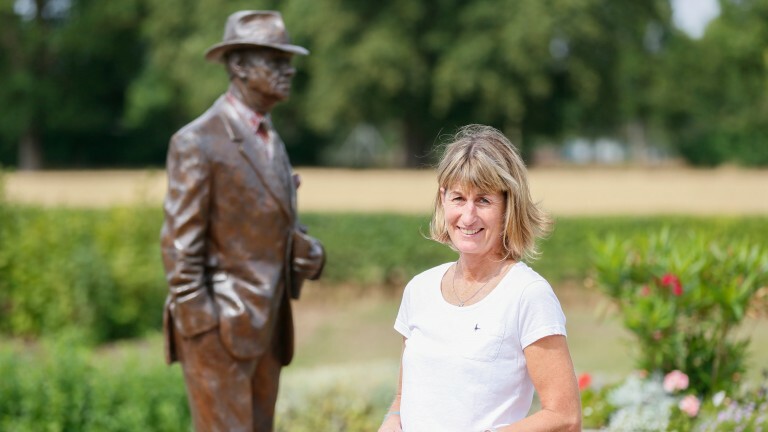 Racing is ground-breaking within sport, and the IJF a unique role model. No other industry offers such a well-structured support system that protects and cares for all those involved within its boundaries, for the rest of their life if needed. The trip to Spain opened my eyes to many things. I already knew what a difference the IJF makes to lives and how we – I – would be lost without them. What I didn’t expect the holiday to do was to return my peace of mind, something that floated away as I lay in the mud, one damp day in November. It made me appreciate it wasn’t my fault I was left alone when I needed someone the most. I was just the stronger character left to sail my ship alone. The experience has certainly made me a better person. I want to give something back to those we rely on in the hardest of times. Maybe help those who are in real need, now I can understand the journey they go through. And remember, when the time comes to buy your Injured Jockeys Fund Christmas cards you are changing people’s lives, including mine, and for that I want to thank you. Jo Foster has donated her fee for this article to the Injured Jockeys Fund. If you’d like to make a donation, click here.